Mr Samuel Oluwafemi Ayanleye is a passionate youth with strong background and trac records in Forestry education, Climate action, Environmental Sustainability, Youth engagement and Leadership . He is a Co-founder and Head of Communications at Edenworld Initiative, an organization based in Nigeria which is centred around Forestry education, tree planting and Climate change campaigns in raising the awareness on the need to reduce emissions. He is also a core member of Protectozone, an organization that is focused on improving the livelihood of marginalized people in Nigeria and the African continent. He is a First Class graduate and also double-up as the Best Graduating Student from the Department of Forestry and Wood Technology at the Federal University of Technology, Akure, Ondo State, Nigeria (2017). He is currently a First Year MSc. Student at the Faculty of Forestry at the prestigious University of British Columbia, Vancouver Canada. He was an active member of IFSA LC FUTA, Nigeria and currently the Head of Special Events (Climate Change) at IFSA-UBC. Here is a brief interview with the young scholar where he shares his experiences in the profession, his scholarship story, current involvements and future aspirations. How did your passion for forestry start? I wanted to get a discipline in pure science or life/medical sciences but I was admitted to study Forestry and Technology in FUTA in 2012. I was so perturbed when I got the admission to study this strange course of study but I was motivated by my brother to go for it and make a good grade. I tried to change my discipline for three years at the expense of my academic performance in FUTA but all efforts proved abortive as I got rejections after rejections. I was even trying to change to University of Ilorin at a point but it botched at the Final stage. It was at this juncture I realized that God is preparing me for something big; the future was not clear to me- but I was just working hard till I got myself to study at one of the leading Faculty of forestry in the world (University of British Columbia) where I have found more joy and passion in the field of forestry. When I was in 200L, I met some young and brilliant minds who have done well in Forestry like Dr. Julius Adewopo, Yemi Adeyeye, Tolulope Daramola to mention but a few. These people gave me the needed motivation to push beyonds limit in order to achieve my goals but, on a condition, I should take my studies very serious because opportunities won’t fall on my laps if I don’t have my laps where opportunities can fall. I started getting involved in several capacities including NGOs, Youth groups and Clubs and Platforms that are relevant to my future aspirations. What are the mind blowing opportunities you mentioned about earlier? It is no more news that forestry is not very glamorous in some African countries including Nigeria but getting to a developed country that values environmental sustainability like Canada has changed my overall perspective about the forestry sector, it is well respected field since the country generates more revenue from the sector (Forest industry contributes about $24.6 billion to Canada’s economy in 2017). UBC Forestry is also one of the leading institutions in forestry where there is hi-tech facilities and application of latest and advanced technologies to manage the forest and its resources, the use of drones, robotics and artificial intelligence in monitoring and quality control processes. I was particularly amazed at the diversity of experts in the field. Can you throw some light on the application process you underwent? I was so determined to get higher education abroad which made me to start the application process in my finals. I must say the application was very tough considering the commitments, competition and massive pool of applicants. The most important point to make here is that Academic Grade alone is not enough in clinching the spot as the world needs transformative leaders who are ready to make change in all capacities. Aside the good academic performance, leadership prowess and professional development will help to beat the competition. The idea is that a scholar should not only be buried in books but have knowledge, ideas and motivations to pioneer change and make important contributions to the world. What other skills do you think students need to equip themselves to be successful? IFSA is a good one to start with, IFSA is a good platform to meet young people in the field to share knowledge, research, opportunities and make important connections for the tasks ahead; I started the growth process with IFSA just like other vibrant people doing well in the field. The art of networking is also one of the prerequisite in getting both local and international recognition. I believe every forestry graduate should learn it as they move up the career ladder. I stay up all night during my undergraduate education to connect with my friends and mentors from all over the world because of time difference between Nigeria and most countries of the world. IFSA is one platform which naturally gives you the opportunity to learn the art of forming bonds which is important in changing level. Spending quality time on professional networking space like LinkedIn is also important, there are millions of people in LinkedIn who are ready to help young and passionate people in all field- take advantage of that to build yourself; learn from the success stories of others and let it catapult you to victory. It’s that simple !. Can you give us an insight about your leadership/Voluntary experience? I will say my Leadership experience started when I joined Environmental Conservation Club in FUTA which is an organization that majorly advocates for conservation and environmental sustainability in FUTA. I joined the group and attends meeting from time to time to keep me abreast of the opportunity in the environmental sector. I also got involved with IFSA FUTA LC; I was part of the Electoral committee for my LC with nice record of conducting successful elections and also worked with several executives on projects that helped students learn more about IFSA and influence their overall perspective about forestry. I was a former NSEC (Nigerian Society for Environmental Conservation) FUTA Coordinator which gave me the opportunity to work on projects, organize seminars and collaborate with like minded organizations on campus to achieve conservation goals. In my finals, I co-founded Edenworld Initiative, NGO centered around forestry education, climate change campaigns and tree planting (https://edenworld.org.ng/). This was the beginning of my story before I moved to Canada. I am currently the Head of Special Events (Climate Change) at IFSA-UBC which gave me the opportunity of working on projects and forming collaborations with organizations interested in achieving reduced emissions. I was a represented of IFSA-UBC at the Committee of Forest and Forests Industry conference in vancouver where I contributed to discussions around Canada’s strategy to meet sustainability goals and raised the voice of the youths in the sector. 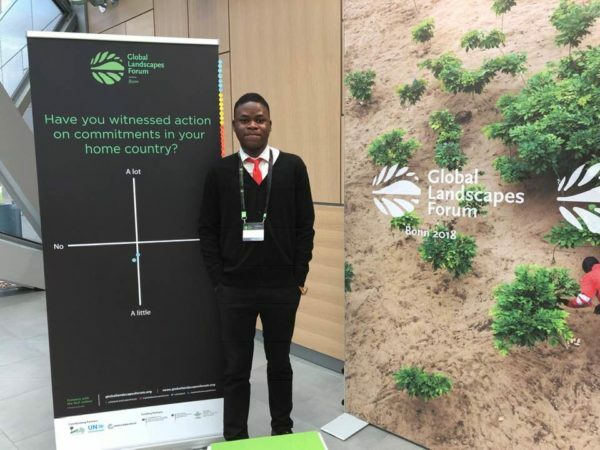 Just recently, I was part of the delegates of IFSA-UBC to Global Landscapes Forum in Germany where I learnt a lot about Collaborative leadership, youth engagement, communications, leveraging partnerships, climate change mitigation and adaptation strategies and collaborations in achieving the SDGs. Can you tell us the challenge you are facing over there? Academics is very rigorous and ability to balance academics, research commitment and professional development is a big challenge. I believe it happens to everyone who finds themselves in a new system where they have to learn new ways of doing things. The article was developed by Opeloyeru Fatiu Folarin ([email protected]), a current forestry student at the University of Ilorin in Nigeria based on an interview session conducted online and moderated by Alex Bimbo Onatunji ([email protected]).